In order to strengthen any floor; to prevent the joists from moving and also to reduce any risk of the floor sagging, it’s important to add at least one series of noggings (note the third, silent G!). In many cases, as with my floor, only one set of noggings down the centreline of the new floor is required. Where a floor covers a greater span though, it may be required that you have an additional two lines of noggings. You strike a centreline at each end of the floor and then, using a string or chalk line or, if you have something a straight-edge that’s long enough, you join the two marks, marking the top edge of each joist. 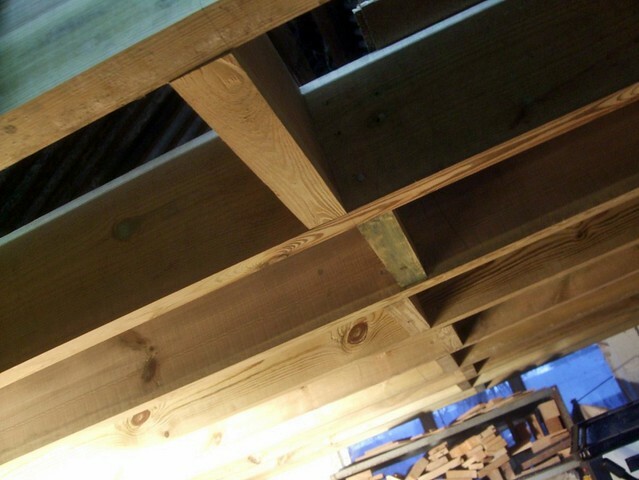 It’s then a good idea to square each line down over the face of each joist, as this helps allow you to visually fix the noggings in vertically. Staggering them either side of the centreline (as in the photo above) allows you to easily drive a nail in to the end of each nogging. If they were all running in exactly the same line, how else would you drive a fixing in? 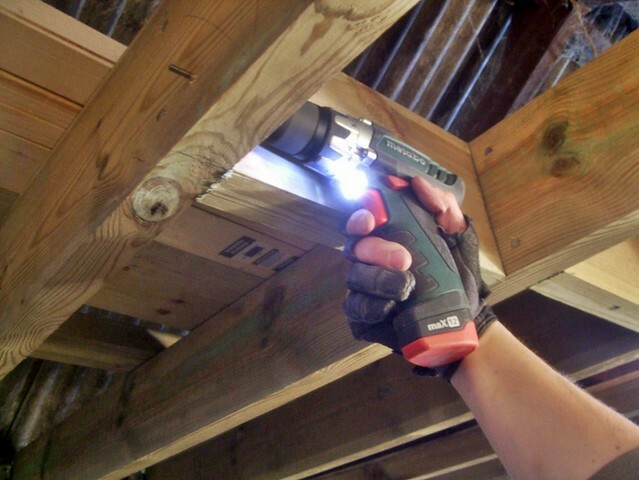 Skew-nailing at angle through the side (face) of a joist isn’t easy, since you need another means of keeping the nogging still, initially, while you’re beginning to bang the nail in. 4in/100mm round wire nails were used throughout. If you’re anything like me though and you cannot hit a 4in nail in all the way without bending it (!! ), a 5mm pilot hole through the face of the joist makes each nail that much easier to drive home! Blocking, in my mind at least, is hardly any different to a nogging – the same principles and techniques are used; it just has a different name. 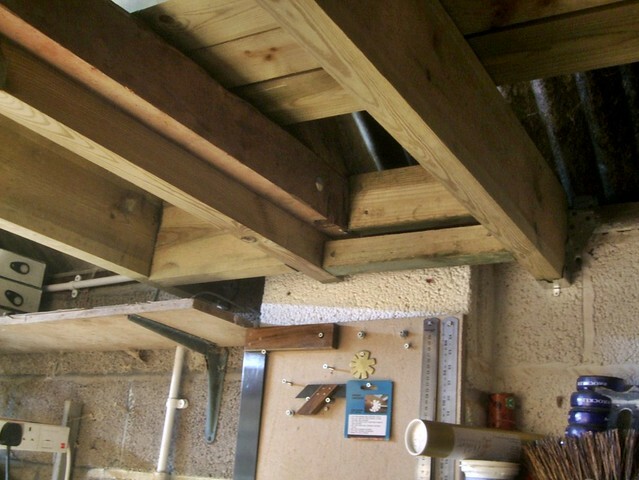 There are other differences, of course but, blocking is generally fit around and to reinforce an existing structure – in my situation, this applied to the existing 4x2in truss with the 7x2in notched joist bolted on to its ‘front‘ face. Instead of trying to notch a wider, 7in nogging at one end to fit around the 4x2in (which could’ve been either hit or miss), I took one short length of 7x2in and ran it through my bandsaw a couple of times – I would’ve used the brand-new Freud blade fitted in to me table saw for this, if only one of the 2in castors hadn’t broken off the MDF stand! This gave me one length at 2in square and another at 4in wide, to match the existing joist that forms part of the truss construction. I found this much easier than trying to notch a wider board and, most importantly, I was able to get a tight fit first time, without any need for trimming. I also found it helpful to skew nail the 2x2in in place, as it will otherwise be liable to rotating, if it’s only fixed with one 4in nail at each end. Throughout this stage of the build, I found it helped, when measuring for noggings, to cut them 2mm longer than the reading on my tape measure. This ensures a very snug fit and, fortunately, I was able to use my sliding mitre saw for these short lengths. As you’ve probably gathered by now (!! ), I don’t have a lot of space in my workshop. Working on a project of this scale when you’re surrounded by several large machines is neither convenient or easy, when you have nowhere else to store them. I mean, the workbench allowed me to reach up to fairly high places, as did my Black & Decker Workmate, I must admit… 😳 Each day, along with several long lengths of timber and my folding sawhorses, I’ve also had to drag the table saw outside, just so that I could find enough room to position the Workmate, at times. As a consequence of rolling the saw up and over the near-2in step each time, one of the 2in castors (which was, admittedly, only held on with round-head screws) broke off from the MDF cabinet I made late last year! I’m now looking to replace them with 3in castors, which I should be able to bolt to the base , even though they will increase the working height by an extra 25mm or so. So, my floor is now ready for the chipboard (provided the joists don’t require too much work to level them) and yet, I currently have no safe way to get up there… After lugging all this wood around, I’m too weak to pull myself up there from my workbench – to give you some idea – I can still get a good 1.1m on top of my workbench, leading up to the under-edge of the joists (so, the new floor begins a good 2m above floor level – I’m only 1.85m, or so). 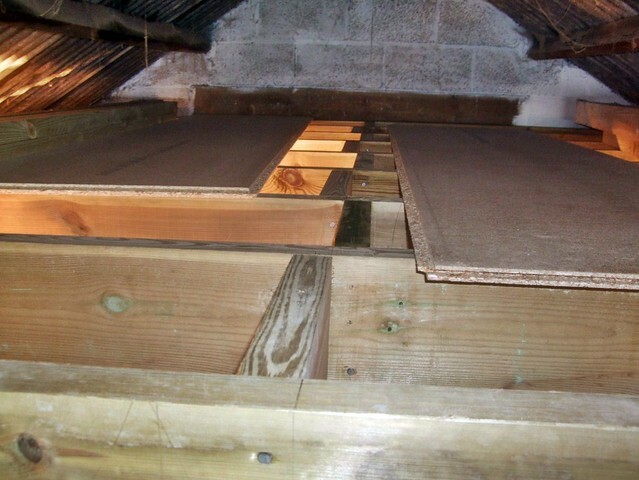 A sliding or folding loft ladder would take up too much room on top. So, I’m looking at buying a lightweight aluminium ladder (as they’re reasonably cheap, these days), at least for the time being. I’d much prefer to make a wooden ladder to my own design, of course; I even have some 2in thick beech which is long enough for the sides or stiles… However, until I’ve actually finished this floor and have been able to return my workshop in to some kind of state that loosely resembles a form of ‘organisation‘, I can’t get in to doing any serious woodworking. Pilot holes for nails = good idea. Was it just a question of cost that you didn’t choose screws, or was there some other good reason? In general, I always prefer screws, but that is probably because I am always using reclaimed timber, and the nails often cause more trouble. Good luck with the rest of the build, looks like you are mostly there. It wasn’t so much a question of cost; whenever I’ve done this sort of work before, I’ve always used nails. I don’t know whether screws have a lesser tensile strength, or something but, nails always seem to be used by builders and carpenters. I know from experience that stainless steel screws can be ‘brittle’ – it’s very easy to shear the heads clean off, if you over-tighten them. Agreed, it does seem tradition to use nails – I was just wondering whether there was more to this than expedience and ‘that’s the way it has always been done’ reasoning. I hear you on the stainless steel screws front. Though I must say they seem to vary a lot! When I was making the oak doors for our work space, I actually did a bunch of tests with different types of ss screws. Between manufacturers they varied from shearing at a measly torque setting of 6 (out of 15) on the drill, through to surviving the max torque setting consistently. And these were similar dia. screws. I like the new improvements you should have loads of space now to store your timber. Have you thought about using spax screws i’ve never had any trouble with them. Yeah, I used to use Spax screws. Don’t really know why I stopped; I guess price is partly to blame although, they’re not too much more expensive than ordinary steel screws? Their heads were great. You could get a very tough grip with a Torx bit and they were ideal for fixing stair strings to a wall (one example of where I’ve used them). It’s a Renault Kangoo and I should, hopefully, be buying it tomorrow. It’s the type with windows all round rather than panels on the sides – somewhere between a car and a small van. Very similar to the Citroen Berlingo and Peugeot Partner models. If this offer hadn’t come about locally, I’d probably be looking at a Ford Focus estate or similar, as Berlingo’s tend to go for well over £1,000 second-hand and, unless it’s got a petrol engine, the mileage is often over the 150,000 mark. sounds great i remember when i bought my van last year you’ll be amazed at how much you can get in the back. I look forward to hearing more on it. Was you a site carpenter before you went back to college to do cabinet making? Well, I’ve never worked on a proper building site but, I’ve done a fair bit of “domestic” stuff (most second-fix) round people’s houses. 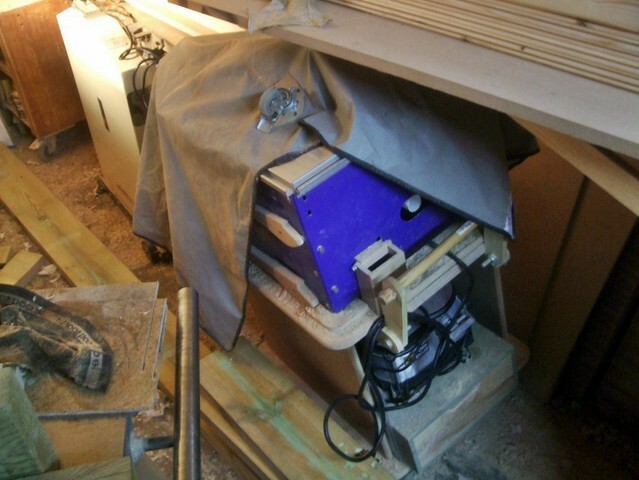 I also spent a couple of years working in a joinery workshop, before I went back to college. What van did you go for? I bouhgt a suzuki carry van best van in my opinion cheap to tax and run and i can get my dewalt chop saw stand in the back which u can’t do in most small vans. I also do a lot of 2nd fixing for people i’m glad i got into carpentry now. Just deciding if i should start getting 110volt tools now just in case i go on site. I suppose most of yours are 240volt. What do u think is wrong with your circular saw, new brushes or fuse perhaps. I started out buying 110v tools while I was studying Carpentry. I still have a few things (my ½in router being the main one) but, over the years, I’ve come around to selling most of it and replacing it all then with 240v stuff! 🙄 Running a workshop with 110v kit isn’t easy. I like to be able to plug most of my tools (sanders, biscuit jointers, etc.) directly in to a vacuum extractor for automatic power take-off – that’s also worth having if you’re power planing doors in someone’s house! Otherwise, a dust bag would fill up in seconds! I’m not sure what to suggest though, I’d advise you to think very carefully, as you won’t want to be dragging a transformer around to people’s homes if you’re only doing to very occasional bit of site work… Think about which tools you’re likely to use on-site (large router, skil saw, etc.) and perhaps purchase only those in 110v. 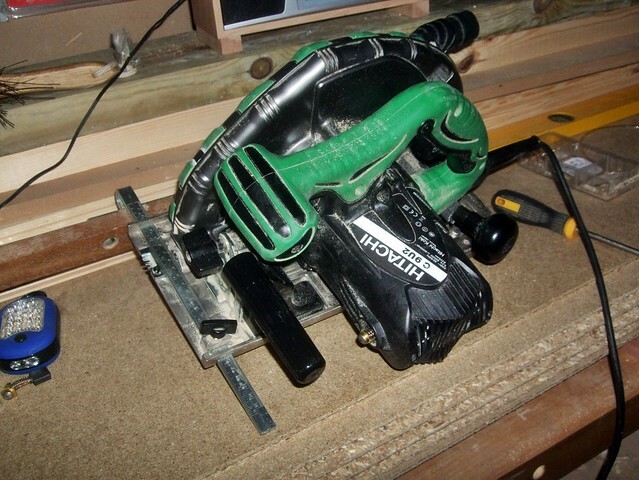 You’re less likely to need a biscuit jointer or random orbit sander, in my opinion… If the worst came to it, I think you can still run 230v tools from a generator on-site? It looks like it could be one of the brushes with my saw – well, I’m hoping it’s nothing more! Both brushes were scratched on their ends, which could suggest there’s something in or on the commutator (I need to clean it, very carefully). One brush had shattered in its holder though and I had to dismantle the saw so that I could tap it out! Ordered some spares yesterday but I’m not sure when they’ll arrive.